And with that, it all came rushing back. A few seconds earlier I'd been flicking through the menus of Xbox Live Arcade. Now, almost instantaneously, Rez HD had me revisiting the same vivid emotions I experienced a half decade prior. Replaying the original Rez wouldn't have been the same. Though Mizuguchi's music-based rail shooter hasn't changed since 2002, my perceptions certainly have. I can't sit down with the PS2 release and experience much more than a pleasant twinge of nostalgia. 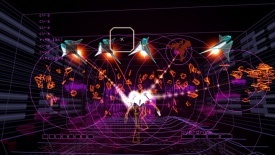 Like most older titles, compared with the crisp visuals of current generation games, the original Rez comes up short. It's ironic that the rapid pace of technology, while one of the most exciting aspects of the gaming medium, can also be the kiss of death for older titles. Most games look dated within a few years, and few hold up well into a new console cycle. Games that were graphically breathtaking on earlier hardware look like muddied messes once new tech arrives. The same principle holds true for games' non-visual attributes, but to a far lesser extent. Rez is a perfect example. Its original visuals now look unpleasantly jaggy, but at the game's core is an experience whose appeal remains intact. Rez HD is little more than a widescreen, anti-aliased, 5.1 surround-enabled revision of the original, but it's pure bliss. It's amazing what a fresh coat of paint can do for a well-built game. Rez isn't the first important title to receive a facelift, of course. Resident Evil, for example, benefitted from a major update in a 2002 GameCube version of the 1996 PlayStation original. In the same year, Nintendo's boxy little console also hosted a completely reworked version of Metal Gear Solid with MGS: The Twin Snakes, also released six years after its PlayStation predecessor. And, more recently, Lara Croft graced multiple consoles and the PC in Tomb Raider: Anniversary, a rejuvenated version of the 1996 classic. Like Rez HD, these modern revisions preserved, updated and revitalized memorable gaming experiences. In the GameCube version of Resident Evil, the window-crashing Dobermans were once again terrifying. Tomb Raider: Anniversary freed Lara from the cumbersome controls of the original game and finally let her move with confidence and fluidity befitting her character. And in MGS: The Twin Snakes, Solid Snake had actual eyes instead of a dull shadow beneath his headband. With the likes of GameTap on the PC and ever-growing libraries of emulated titles on current consoles, it's getting easier to replay old games on modern hardware. But revisiting those games in their original forms is often painful. Some, particularly simple arcade titles, hold up well. The majority, however, aren't nearly as enjoyable for audiences accustomed to better-looking, better-playing games.